Slow Cooker Pumpkin Bread is an easy treat that’s “baked” in the slow cooker! So quick to put together and delicious! Click here to see The BEST Sweet and Savory Instant Pot Pumpkin Recipes! Click here to see more Desserts Recipes. (For Friday Favorites we spotlight past recipes that you may have missed, and this Slow Cooker Pumpkin Bread from Six Sisters’ Stuff would be a delicious treat for any day of the week! This is the time of year when it’s pretty much mandatory to bake something that includes pumpkin, and this Slow Cooker Pumpkin Bread from Six Sisters’ Stuff is about as easy as it gets! Get the Complete recipe for Slow Cooker Pumpkin Bread from Six Sisters’ Stuff. Click here to try Instant Pot Pumpkin Chocolate Chip Bundt Cake if you prefer that method. Check out the Index Page for Dessert for all the slow cooker baking recipes that have been featured on this site. Is it just me, or is there no measurements for the ingredients? Under the photo only lists what ingredients are used, but no measurements. Can't really use this recipe. Sonya, this blog finds "from scratch" recipes from other sites and shares them. There is a link below the list of ingredients to get the recipe from Six Sisters' Stuff. You'll have to click that to get the actual recipe. 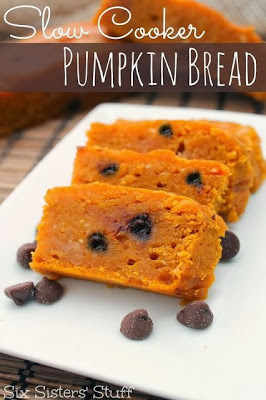 I may have found a slow cooker pumpkin bread recipe to convince you Lydia! I made it this week and will be posting it soon. 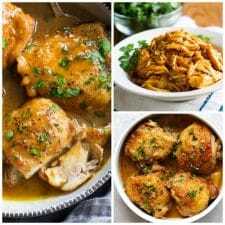 I read somewhere that one of the keys to baking in the slow cooker is making sure your the pan you use allows at least 1 inch of space all around so that air can circulate. Martha, look forward to seeing yours.